Spring and summer bring the promise of warm days, pleasant evenings and the pleasure of al fresco dining on the deck, porch, or patio. We feature a Spring and Summer selection of bright Provencal styles from Vent du Sud and Plum Brook, bold prints from Beauvillé, and imaginative jacquard weaves from Garnier-Thiebaut. 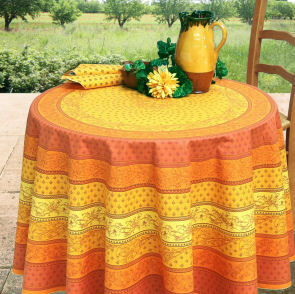 Many of the patterns are available in Teflon coated fabrics that maintain the look and feel of fabric, but are spill proof and easily wiped dry. Several coated fabrics can be ordered by the inch, and cut to size without requiring hemming. See our Spring and Summer suggestions.